We've looked at so many elephants that today, we introduced ourselves. 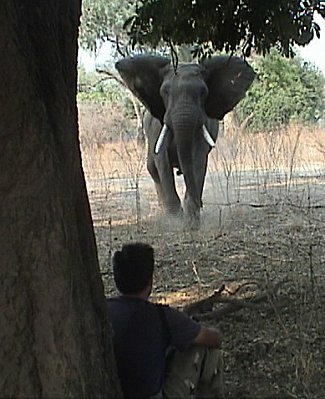 We sat under an acacia tree and watched the elephants arrive. One large bull waved his nose in our face. 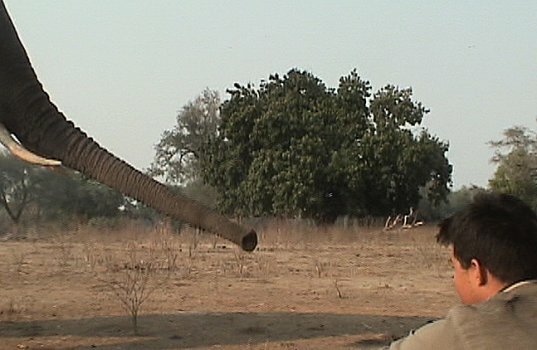 A bad tempered elephant ran at us, kicked dust, and shook his head. 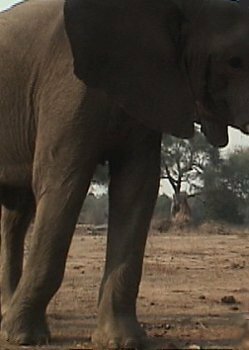 We saw another elephant stand on his hind legs, fully upright, and reach the high branches, but he wouldn't do it again for a photo though we asked repeatedly. .You should change your shampoo. Finally...fish for dinner. 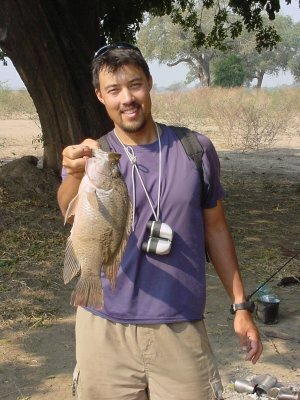 This is a bream, the best tasting fish in the Zambezi. Other species include chessa (good for bait), squeakers (poisonous fins), electric eels (300 volt shocks), vundu (man-sized catfish), barbels (a smaller catfish), and tigerfish (many fishermen have lost their fingers to a tiger's teeth).